The first original test-piece for brass band (Labour and Love by Percy Fletcher) was composed in 1913 for the National Brass Band Championships, held at London’s Crystal Palace. For the centenary of that event in 2013, I decided to write a work that pays tribute to some of those early test-pieces. The list of the composers is a distinguished one of course, including well-known names such as Holst, Ireland, Elgar, and Howells, alongside other less familiar ones. The brass band tradition owes much to them, for through their music they established a truly homogenous ‘British’ brass band sound that has spread throughout many parts of the world. That tradition flourishes today and remains important for today’s composers, even if their musical language is far removed from that of their predecessors. Of Distant Memories pays homage to these composers and their music, and in the process summons up a kind of subconscious memory bank of the musical languages, styles and forms used by them. Although conceived in the form of a ‘traditional’ tone poem, reflecting the form used in those early test pieces, other aspects (e.g. instrumentation, texture and colouration) are more contemporary, as befits a composer writing in the 21st century. However, the percussion requirements are fairly modest by today’s standards, and are similar to those used in the works of that period. Of Distant Memories is one continuous movement and opens with a rather slow, broodingly ‘Romantic’ melody, which becomes the main reference point of the entire work. The mood then changes and the music bursts into life, firstly with a fast and virtuosic scherzo, then with an heroic march. The mood changes yet again, and we are now transported into the world of English modal folk song, with thinly veiled scoring supporting lyrical solos for all the main soloists in the band. Linking all these sections together are references to the opening tune, transformed and varied each time. The fast music returns, eventually leading to a majestic recapitulation of the opening melody. A triumphant coda brings the work to a fitting climax. The work was jointly commissioned by the Black Dyke Band and the Worshipful Company of Musicians (with funding generously provided by John Iles, grandson of the great John Henry Iles, the impresario without whom there would be no such repertoire or tradition). 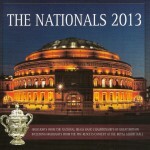 It was premiered at the RNCM Festival of Brass in January 2013, and then used as the test piece for the National Brass Band Championship of Great Britain, held at the Royal Albert Hall, London, in October 2013, The winning band on that occasion was the Cory Band from South Wales. For many, the promise of a new work from Edward Gregson to close the concert was something to look forward to and Of Distant Memories did not disappoint. Taking its influence from the works of a bygone era (Dyke’s trombones really getting their teeth into the Life Divine quotes), it has instant classic written all over it. Interestingly, the music also seems to be a welcome return of Gregson’s elegant early works, despite its dismissal by the composer as a “style conversion piece”. It was certainly well received. 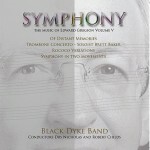 … a superb compositional homage to the styles and inspirations of the iconic test piece composers of the movement’s past. This was Gregson as part pastiche craftsman, part contemporary modernist, part inventive, warm hearted fan, in a work that expertly satisfied the taste buds of the traditional and the original palette in equal parts: It will be heard time and again to be sure.